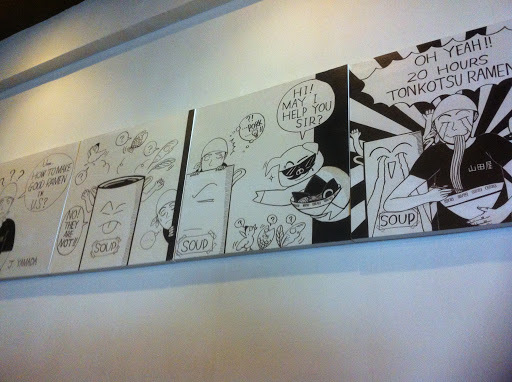 I had lunch yesterday at Ramen Yamadaya in Culver City. Since I’ll be working in the DTLA quite a bit in the next month or so, I thought that West LA would be my next target area for ramen. I ordered the Yamadaya Ramen, which is really just a regular Tonkotsu ramen with extra toppings. It included two types of pork, (regular chashu and bbq chashu) marinated egg, seaweed and bamboo… eek! Shouldn’t have read that menu too fast! I have a sneaky little feeling that they accidentally gave me a tonkotsu kotteri with the toppings, as I had noticed a large amount of fatty pieces floating around my ramen. Another eek! 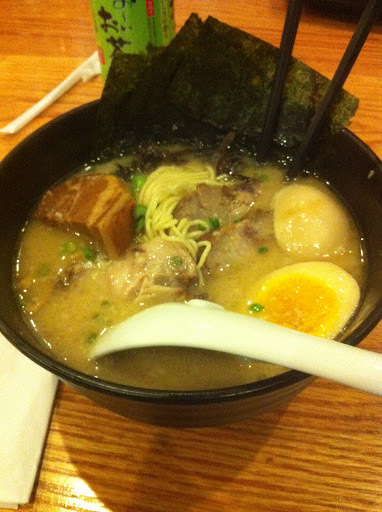 The broth had a good flavor but it was too oily for me and on the saltier side. The noodles were great though, I liked the firm texture and the flavor. They reminded me of the noodles at Shin-Sen-Gumi. All the toppings were good too, the two porks were tender. The egg was nice and the seaweed. The one thing that kept me from finishing my broth was the bamboo, as its flavor had spread all over my broth. Yuck. The service was not that great. I was seated right away because I came in by myself, and was seated at the hibachi table with other customers. The servers pretty much ignored me during my meal. They seemed to only care about taking your order, bring your order (which I don’t think they got correct in the first place) and only spoke to you again when you were done. It was really hard to get their attention. Overall, the ramen was good, but I would not go out of my way to eat here. Maybe I’d give this place another try but not anytime soon. I had completely forgotten that I’ve been to a Ramen Yamadaya before. I was reminded by Tanya when she made a negative comment about the place on my FB post about eating here. She was not too crazy about the ramen at the Torrance restaurant. I obviously forgot what the ramen was like, otherwise I would have known what to expect here. If you like fatty ramen, then definitely check this place out. Who knows, it might have been one of those days that the service was not outstanding. If you do go, it’s on the corner of Washington Blvd. and Commonwealth Ave. right off of the 405 freeway in Culver City. Parking can be found on the street or behind the restaurant in the alley way. This entry was posted in Food, Ramen, Ramen Run, Uncategorized and tagged Broth, Commonwealth Avenue Boston, Culver City California, Ramen, Ramen Yamadaya, West Los Angeles. Bookmark the permalink.